"Peter Potterfield is the quintessential adventure journalist. His books and magazine assignments have taken him from some of the most remote regions of the planet to the cockpit of supersonic jet fighters..."
Journalist Peter Potterfield has written more than a dozen books on outdoor adventure. He has contributed to Outside, Conde Nast Traveler, National Geographic Adventure and other major magazines. He helped develop online adventure reporting as editor of MountainZone.com and was a finalist for the National Magazine Award for General Excellence as editor of Pacific Northwest magazine. Potterfield is currently editor of GreatOutdoors.com, where he writes his regular column, Wilderness Notes. See published works for more adventure reporting by Peter Potterfield. Published by WW Norton & Co. Revisit Peter's previous book, Classic Hikes of the World, the most successful hiking book of the decade. Potterfield brings savvy insights, practical planning tips, detailed route info and a refreshingly stoked, conversational tone. (Classic Hikes) can be hauled at least as far as the trail head . . . but far more transportable is the inspiration Classic Hikes evokes. "One of our finest chroniclers of climbing tells us what we need to enjoy North America's most spectacular hikes. Potterfield's writing is elegant and engaging: Open "Classic Hikes of North America" to any page and see if you don't feel you're already out there." "If I could own just one guide book for hiking, Peter Potterfield's refreshingly well-written Classic Hikes would be it-and it would keep me busy for the rest of my life." In The Zone chronicles some of the greatest mountaineering survival stories ever told. "In the Zone is a compelling look at the dark side of mountaineering." Potterfield's matter-of-fact style gets you right into the climber's head. I loved this story and could not put it down. "Classic Hikes of the World covers the best routes through the most scenic landscapes. Peter Potterfield has written about the world's greatest hikes, and his first-hand information is as useful as it is fun to read." Forget the hype about the new "extreme" sports; it's hard to beat Peter Potterfield's harrowing In the Zone, an account of three deadly climbs. 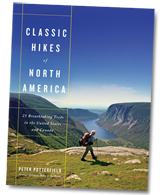 "Peter is the best informed, the most complete, readable and exhaustive hiker in North America... This tome is invaluable." © 2005-2019 PeterPotterfield.com. All Rights Reserved.